Today’s Oldies Sunday was one that should’ve been posted a long time ago, but a recent event inspired its publishing. Remember when Dancehall Artist Shenseea released the visual for her “ShenYeng Anthem“? While many enjoyed the single, there were mixed reviews for the music video because of its intro. With today’s entry, I feel there would be some “outrage” from some folks if this was released today (some folks argue about every little thing online). Today’s entry comes from Chalice (though they were featured before, this song features mostly one of their Vocalists) with their single, “Sayonara“. Written by the legendary Lloyd Lovindeer, this was performed by one of the band’s Vocalists, Wayne Armond. Released through CTS Records in 1986, and Bold Reprive Records in 1987, this track features some Oriental influenced production with Wayne singing about his experiences with a Japanese woman in Jamaica. “Sayonara” (which means “Goodbye” in Japanese) was featured on the band’s “Crossfire” album and was popular in the 80’s and early 90’s. The video for the single was shot in Portland and featured the Boston Jerk Centre. Get familiar with something old by checking out the track below, and share with a friend. Show us some love on Instagram at @13thStreetPromo. This Oldies Sunday selection is for the lovers, and it comes from the “Songbird from Jamaica“, Karen Smith! Today we go back to the year 1986 with “Wide Awake In A Dream“. 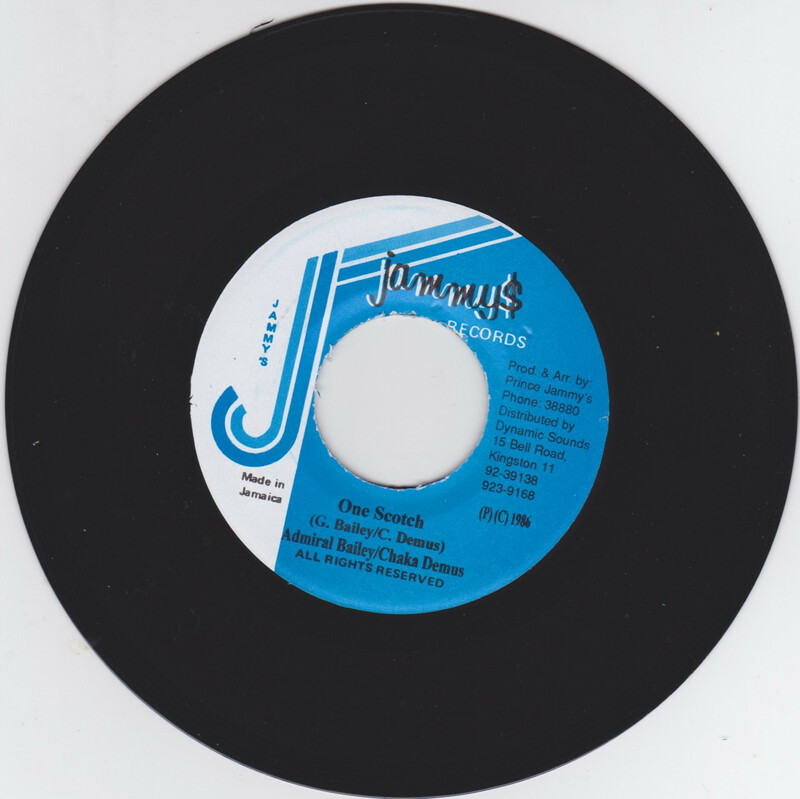 Produced by Clifton “Jackie” Jackson, this was a cover of a single that has been sung by the likes of Barry Biggs, The Blues Busters, Jerry Jackson, Lyn Collins, Vickie Anderson, and Ken Boothe. Once she stepped into recording mode, Smith added her own flair to the track as she expresses how she feels about the love of her life. A video was also shot for this single, and it was directed by Alfonso Walker (I remember seeing this video a lot growing up on local TV). Today’s Oldies Selection comes from Deejays Admiral Bailey and Chaka Demus. Titled “One Scotch” and produced in 1986 by Prince Jammy’s (Now King Jammy’s), the deejays meet up at a bar and order their regular drink choices of one Scotch, one Bergerman (Bourbon), and one Beer all while dropping lyrics about having bullas with avacado, having money to take a plane trip and even a little chant (Demus). This song was inspired by Amos Milburn’s 1950 hit “One Bourbon, One Scotch, One Beer” and became a big hit in Jamaica.